While Mount Everest is in many ways still the zenith of climbing, it has recently become a circus of sorts with ramshackle expeditions running roughshod up the mountain with little regard for ethics and safety. Thus our team, like many other climbers, have a strong desire to go to remote peaks that are little known, rarely climbed, and yet offer a true alpine experience away from the crowds. Gurla Mandhata, or Fairy’s Peak in Tibetan, is just such a mountain…few have heard of it and fewer have seen it. In late August, 2006, I will lead a group of climbers to remote Gurla Mandhata. We will begin our adventure along the ancient pilgrimage route to holy Mount Kailash, the sacred peak for Hindus and Buddhists. Starting in the remote Nepali village of Simikot in the Far West Region of Nepal, we will trek northward, crossing into Tibet via the Lechu La near Hilsa. From there, we will continue north to Kailash to complete a sacred kora, or circumambulation, of the holy mountain. 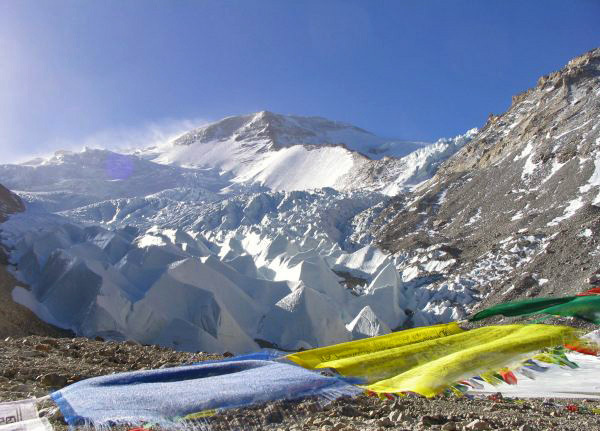 After the kora, we will head south once more to establish Gurla Mandhata Basecamp at the foot of the Zalompa Glacier. The team will climb along a route pioneered by Tom Longstaff in 1905 (but not climbed until 1985), following the Northwest Ridge through three camps to the 25,502 foot summit…the fourth highest peak wholly in Tibet. If successful, the 2006 American Gurla Mandhata Expedition will be the 13th party to reach the top of this Himalayan giant, and from my research we will be the first American team to do so. This is an amazing accounting! A big hello to Stuart! You are missed! Btw- Pete and Kelli’s baby pics are darling! Leave a Reply to Catherine Nowak Click here to cancel reply.